Hah! The instructor gave me the green light to practice driving on my own because, according to him, I'm no longer a public hazard — as long as I stay off the busy streets. I'm squeaky pleased. Have finally gotten the hang of downshifting before taking corners. Yay! Now I just need to improve my visual periphery when it comes to crossing pedestrians/pooches/vehicles and staying on the right side of the road. Hee. Nthposition accepted two poems, On tiles and All Perfectly Abandoned for their December 2006 issue. Very quick response times, too! Preparing this submission just tickled the in me. Heh! • Déjà Vu Diner by Leonard Gontarek. Oooooh and aaaaah. Poetry samples can be found at Unpleasant Event Schedule. To read his poetry is to believe it. • lucky wreck by Ada Limon. First came across this poet in Tarpaulin Sky with her mind-blowing poem, First Lunch With Relative Stranger Mister You, which also happens to be the opening poem in the book. Yikes. Managed to taper off the subs from 112 to 30+ last night. This morning, seven hours later, it's back to 71. Have never handled these many submissions in the whole time I guest edited for Niederngasse. It's quite exciting though. The open slots for poetry are only 12-15. It's only the third day of TPM's reading period and I've already got all slots filled. I'll be in for some very tough choices. Pfew! Have survived for more than a week now. Not writing terribly inspired stuff, but am just thankful that I'm writing again. Can hardly expect more after a two-month hiatus. Have been doing it with the old git's son. Yay! I like how he explains things to me slowly and calmly, like a voice-over recording. Sort of understand better the mechanics of taking corners... now if only I can get my poor limbs to act out what I know I must do, I could start driving seriously. It's a sad fact, of course, that I've got the reflexes of a sloth. He actually said I wasn't as badly off as I said I was. The sadist has scheduled me to take the practical exam end of September. Gaaaaak! OMG. Someone pinch me awake. Just received a congratulations e-mail from The Frogmore Papers editor. Announcement of the result of the Frogmore Poetry Prize for 2006, sponsored by the Frogmore Foundation and adjudicated by Ros Barber. The Frogmore Poetry Prize for 2006 is awarded to Arlene Ang of Spinea, Italy for her poem THE 23rd SECRET LOVE POEM. She receives the sum of two hundred guineas and a life subscription to The Frogmore Papers. The first runner-up is Michael Wyndham of London for his poem KNOW YOUR ENEMY. He receives the sum of seventy-five guineas and a year’s subscription to The Frogmore Papers. The second runner-up is Angela France of Cheltenham, Gloucestershire for her poem REJECTING GRAVITY. She receives the sum of fifty guineas and a year’s subscription to The Frogmore Papers. I even got a second poem shortlisted. It's freaky, so freaky that I've just got to do my purple banana dance right here, right now. Wooooooheeeeeeeee!! Please don't send it to me personally via e-mail. First, because the hunting season... I mean, the reading period is —erm— still closed. Second, because I don't know how to upload it to The Pedestal database, and have no intention of doing it for anyone — unless you are Bukowski (first name: Charles) and you're too dead to do it yourself. Third, because my Spam Assassin kills off half the e-mail content of people not included in my address book so any submission to that address is trashed directly from the server. So... please submit to the submissions page. And —erm— read the guidelines first here. I can access poetry only from the website, not in my mailbox. It's how the system works. That said, I actually finished reading the few stuff left over from the last reading period of The Pedestal yesterday. I really love their submission system. I even cleaned up after myself as I was instructed to do. Re-learned how to park behind another car. It wasn't as bad as I feared and even inspired me to do something osé. At the end of the lesson, the instructor told me to park anywhere I want in the three spaces he pointed out to me. I parked — well, zzzzipped was more like it, into the one beside another car just to see if I could do it. I even braked in time — just in front of a granny with a baby stroller. Hah! The fella muttered: Lazzarona. You really had to choose this one, huh? And you almost got that granny, too. Assassina! However, when I stepped out, I just had to admire my parking. I was perfectly inside the white lines! Incredible, but true. Wheeeeee! My 10th lesson is scheduled Monday morning. With another instructor — who happens to be the son of the scary old git. He said he wanted to see how I'm doing. Seemed nice and calm. But then so was his dad before he saw me drive. Discovered this neat poetry enabler at The Poetry Library... for poets who are stuck on writer's block. Nate, old pal, if you're reading this, this one's for you. I survived. The driving instructor survived. I was called scatenata (meaning "hog-wild" at WordReference.com) because I drove at breakneck speed around rotaries. The thing is if I hadn't step on the gas, the silly fella would've kept doing it for me. And I hate that. I have my own gas pedal and I'd like to use it now, thank you. However, it is also true that when I stepped out of the car, I thought I was going to break into diarrhea in the middle of the sidewalk. Talk about major paunch-ache. Hee. Woke up this morning still rather pukey from the experience. Was also called assassina twice, lazzarona thrice. Both, when I was told to park near an island. For some strange reason, I decided to change into first gear in the meantime, going lah-dee-dah in my mind, and forgot to —erm— use the brake pedal. The driving instructor was rather forgiving about it since, he said, I hadn't driven in quite some time and he actually expected things to be much worse. Yesterday's practice concentrated on rotaries, the rules on entering and leaving them. I seem to be getting the hang of it. At least, I don't fumble too long with the signal lights anymore and forget I should be going round the rotary, not through it. I can now flick the signal light on and off, left and right, without blacking out into one of my confusional states. Yay! 9th driving lesson scheduled on Friday. At 8:45 AM. • A small packet from Michi containing: Jasper Fforde's The Well of Lost Plots and a 1.5" x 1.5" notepad with a timely note saying: "for mini-poems or horrible-instructor curses!" We enjoyed these and "Inventory of Goodbye" came close. Thank you. On a whim, I kicked myself back into 30:30 this morning. Let's see how long I last this round III. Am also busy juggling four stories with Valerie — two of which are supposed to be possible entries for the Wild River Review Fake Memoir Contest. It's a riot. I spent a better part of yesterday morning laughing my pants off at the stuff I faked in the memoirs. We shall not be using your manuscript. Thank you, however, for giving us the opportunity to consider it. Many of us found your work interesting; I was personal fascinated by the formal dimension of "How a Mother Peels Fruit Before the Funeral." Sorry: an enjoyable + interesting batch from you, as always. We hope you'll try us again. Following a link from Matthew Schmeer's blog (under his thoughts on rejecting poems), I found this hilarious place: Professor Roy and the Amazingly Bad Poetry Journal. I'm rather sorry I missed their contest deadline — with its "no-b.s. actual prize." That would've been quite an award to add to one's curriculum vitae. writing buddies. Wheeeee! Our second finished story, Nature Hates a Vacuum is now online at Edifice Wrecked. Wow, but they're quick!! Hope someone gets a kick out of it — we tickled ourselves silly writing the whole stuff... and will be using the Richard character there in another story (with donkey tails). Thanks to Sharon who introduced me to the 'zine. Discovered it when I followed the link to her terrific flash, Love is the Firmest Foundation (under Ann Walters) in the same issue. After two whole days. Some skipped meals. A squeaky stomach. An irritated bladder. Blurry eyesight. Unchecked e-mails. And migraine. To say. Let's not do that again, shall we? Well. I'm quite beyond myself with delight. Edifice Wrecked recently accepted Nature Hates a Vacuum, a short story I co-wrote with Valerie Fox. Such a thrill. It's our second story and second slated publication — which means we must be doing something right. On top of this, flashquake accepted two poems, The Weight of Seasons and On Seeing the Body Hit Ice for their autumn 2006 issue. The latter also got the Editor's Pick booty. Whooopeeee! The husband brought home a new computer last Friday. Every time someone nosey asks if we have any kids, I get the urge to reply, "We've been genetically modified not to have children, only computers. We have four darlings now. And another one due out this January, maybe Feb."
So, right now we've —uh— got like five of them in the house: the new baby, the retired pc, the old Mac G3, my G4 (i.e. my birthday gift to him and which I happen to be using 99% of the time) and his portable computer. The crazy thing is we actually use at least three of them contemporaneously. 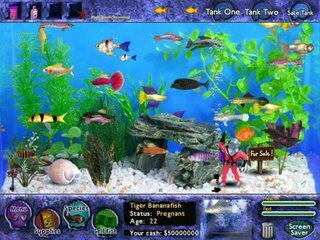 I've literally gone ga-ga over Fish Tycoon. It's soooo cool. 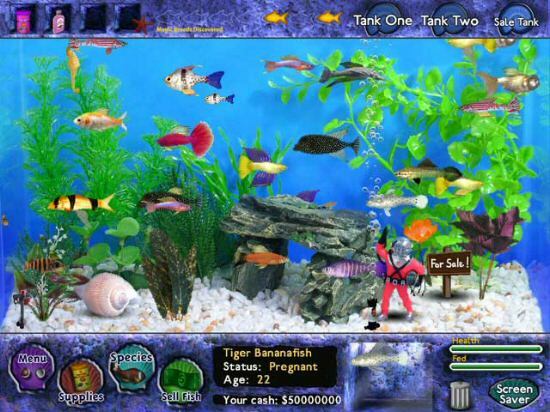 I've got a thing for taking care of animals and this virtual aquarium just makes my cup of seaweed. I can watch the fish for hours and hours... breeding them, selling them and funding the research programs. to get back into writing. Have begun another round of fiction tennis with my playmate, Valerie. Also trying to prepare a submission for the "Alice in Wonderland" issue of Wicked Alice — deadline is on the 15th and I'm running shamefully late. Still very constipated (Nate's expression), but at least I'm reading a lot. Yikes. Tried driving the husband's diesel BMW this morning. Freaky!! It's like that horror car film, Christine. Usually when I shift to second gear, normal cars would just purr nicely. His refuses to limit itself into purring, it literally leaps forward with delight — as if to say, "Wheeeee!! I'm a flying manatee!" Scared me silly since I knew it could drive me to ruins (hey, I saw the movie). I just did an hour of turning around islands in the parking lot on first gear, no gas. Still not getting the hang of corners/curves. Blah. I can start any car like a pro though. Teehee. It's the rest that I'm having problems with. Just discovered that Benjamin Buchholz has put up a page featuring The Dust Girl. I was invited to send him around 10 poems for this anthology some months ago. Lots of exciting and familiar authors. No word yet if it did come through or not though. Here's to hoping it did or will. Have gone on a kefir craze ever since I returned from Manila. My sis-in-law made me drink it (disgustingly weird stuff, like carbonated yoghurt) with the promise that it will clear up my skin. Since I've seen the results in my mom and one of the housemaids, I did. And yay, it really works. Since kefir boosts one's immune system, it's also beneficial for people suffering from AIDS, chronic fatigue syndrome and cancer. I read somewhere that it also has a tranquilizing effect on the nervous system and helps alleviate sleep disorders, depression, and ADHD (attention deficit hyperactivity disorder). So. I brought some fresh kefir all the way with me to Venice. Ironically, it arrived safely... but had a little accident in the car. Since kefir transport regulations (hee) require breathing space, I had to keep the bottle open. My darling husband swerved too fast into a street and it spilled! To put it mildly, we wanted to kill each other after 10 minutes of happy reunion. We argued heatedly for days about who was the real kefir murderer. In my opinion, it's him and he needs remedial lessons in taking corners. In his opinion, I should be charged for double murder — my kefir, his car — and kept under observation in a mental institute because no one in their right mind would leave an open bottle of kefir unattended in a car. In the end, we agreed to disagree about it for the rest of our days and go on with our —erm— lives. Anyway, I did manage to resuscitate a teaspoon of the kefir grains — so all was not lost. The old git didn't show up on the 4th and re-scheduled my driving lesson for the day after. He insisted on wanting to observe how I drive — because recently he received complaints about the other instructor being mean to the students and, being the proprietor, wanted to put things —erm— right. Good grief. The irony of it. He turned out to be really horrid. He was also beginning to get physical which really bothered me. Like the nasty piano teacher I had as a child who would crush my fingers on the keyboard to remind me that I was making tons of mistake. He didn't hurt me or anything like that, but being the focus of such aggression was disconcerting, to put it mildly. He was also giving out contradicting orders — first by telling me to go very slow because I'm still a learner then to step on the gas and go over 50 kmh in streets with a 30 kmh speed limit. Duh! Afterwards he asked me to be honest about what I thought of the other instructor... and —erm— if I wanted him to be my instructor from then on. I told him that actually I never really had any problems with my previous instructor and that I've been with worse ones in my life. No way I'm getting near this guy again! If he insists I'll complain to his wife — who seems a nice person and acts as his secretary. Am going back to the previous instructor who, despite being too cheeky for his own good, tolerated my mistakes with a snicker and never once raised his voice above a mutter. are already up in the August issue of poetic diversity. 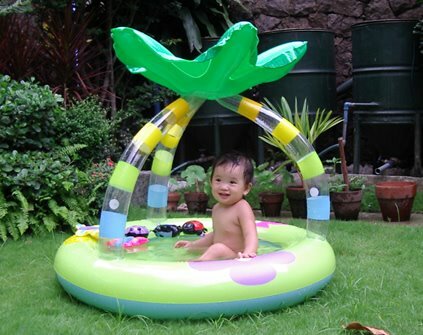 Here's a picture of my niece in the private garden pool I brought straight from Italy. It is, naturally, made in China. Hee. Sweet kid. When her video Barney starts singing I love you/ You love me/ We're a happy family// With a great big hug/ And a kiss from me to you/ Won't you say you love me, too? she'd tug at her mom or dad for a hug and kiss as well. It's the cutest thing I've ever seen — and she's only a year-and-a-half old. Tickles me pink to watch her. I'm halfway to holding my driver's license — as long as I don't screw up the practical exam four times in a row. Yay! Thanks for the well wishes everyone! Must have worked, too since I passed with flying colors. When we girls flocked around the examiner — who incidentally made Agent Smith look harmless — to ask how many errors we made, he went, You, three! You, two! to the girls beside me. When he reached me, the fella snarled: You! Not even one. He looked rather disgusted. Have a driving practice scheduled tomorrow with the head instructor. He wants to check how much I have learned before scheduling me for the practical exam. Have taken a long time doing it, but got to finish everything late last night. I'm particularly honored and ecstatic to have received the Adroitly Placed Word Award at johnvick.org. Never expected this considering the stiff competition. I got a $50 Amazon.com gift check, too. I just received an acceptance e-mail from Rattle. They'll be publishing my poem, A Driving Student Adjusts the Seat in their December 2006 issue. This is the second time in a row — after 9 years of continuous rejections. Totally thrilled — and my multiple selves (Ellen, Angela & Anne) are literally dancing! Really great news this since, in the meantime, I've received tons of rejections, too. Won't bother stating dates (hee, if you want all the sordid details, feel free to e-mail me); I'll just state the names: Jubilat, Perihelion, Cafe Irreal, Elixir Press, Spinning Jenny and two others from book publishers (whose names I can't remember since Valerie sent the submission) regarding the Bundles manuscript. Where to send next? Where? Where? 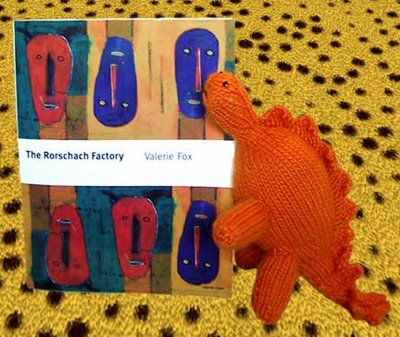 While I was away, Mr. Stegs (a gift from Sharon) and Valerie's book discovered the comforts of inanimate-objects bonding on my faux leopardskin rug. Have begun reading The Rorschach Factory and it's fast becoming a favorite. Amazing poetry. Excerpts can be read here.